The new and curler has just arrived! Shirly has been studied to give to your locks a revolutionary shape: softly natural at the root, tightly S shaped in the middle and big spiralled at the end. 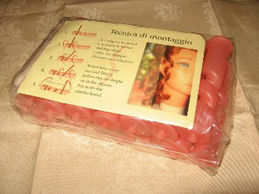 • chemical (perm-liquid) for a long-lasting result. 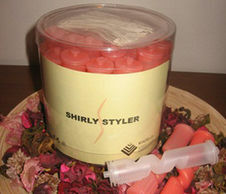 Shirly is presented in a transparent box, the box contains 25 curlers. It is possible, however, to personalize the packaging. Put on the curler beginning from the end of the lock and from the brushed part of Shirly. Block the lock with the supplied elastic band.Follow perm procedure. VIADELO ITALY SRL Copyright © 2012. All Rights Reserved.